It is so freaking hot here that I was really glad to have a light blouse to wear when I had to venture outdoors yesterday evening. I don't remember where I got the blouse; I think it might have been Jessica London. The red jeans I got from Loft, and I will say once again that I am loving their new plus line. Back in my body-loathing days when I draped myself in layers of black fabric, I literally never had a single piece of appropriate clothing for summer, no less for a stretch like the heatwave we're having now. I never would have owned, no less worn, a blouse like the one pictured above. Too sheer; too fitted (and it's not fitted at all! ); far too colorful; too likely to draw attention. The thought of wearing red pants would have ended me! So thank Maude for having moved into a better relationship with my body, because I was exceedingly glad to have a breezy blouse and lightweight pants when my phone was reading "96° | Feels like 106°" ughhhhhh. Anyway! 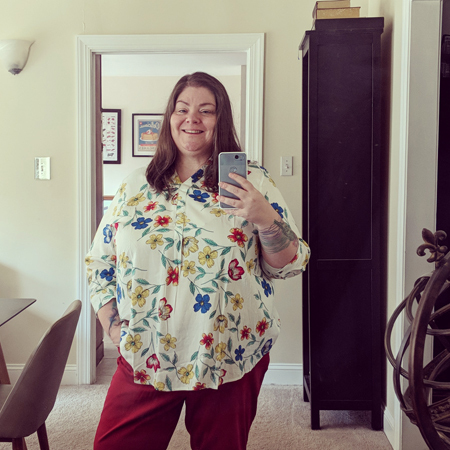 As always, all subjects related to fat fashion are on topic, but if you want a topic for discussion: What's your go-to outfit when it's hot as balls out there?